Dr. Larissa Gupta is a renowned Dentist in Kamla Nagar, Agra. She has helped numerous patients in her 7 years of experience as a Dentist. She studied and completed BDS . 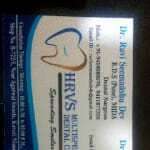 You can visit her at HRVS Multi speciality Dental Clinic in Kamla Nagar, Agra. Don’t wait in a queue, book an instant appointment online with Dr. Larissa Gupta on Lybrate.com. Lybrate.com has a number of highly qualified Dentists in India. You will find Dentists with more than 34 years of experience on Lybrate.com. Find the best Dentists online in Agra. View the profile of medical specialists and their reviews from other patients to make an informed decision. Sir, I m suffering from teeth payria since two year, what I have to do for it. Please suggest me. You need to get full mouth scaling and root planing done by a dentist. And maintain your oral hygiene thereafter by using mouthwash, flossing, etc. I am having cavity issues since the last 3 days. Is there any home therapy? What should I do? There is no home therapy for treatment of cavities. You need a proper filling to reverse it. And in future you should maintain proper oral hygiene to prevent getting cavities. My 5 years old son developed teeth cavities in 4 of them. Do we suggest treatment and necessary refill OR Plan to remove the teeth as anyhow teeth would fall out for fresh new ones to grow. Your suggestions Pls. I think you should get a filling done and save the teeth. As early removal of primary or milk teeth may cause improper alignment of permanent teeth. I just removed my tooth as suggested by dentist. Now I want to implant a new tooth. I don't want to go for a bridge ad it affects adjacent tooth. So I think implant will be better but is there any other option except this two. How much do a implant cost actually. Is there any cheaper thing than implant and bridge. Implant is a very good option as it does not require support from adjacent tooth. The cost varies however depending upon the quality used by your dentist. If you want to go with sumthing cheaper then bridge is an option. Apart from these two. You do not have any other option. Sir. I am 25 year old and I have irregular teeth, what would be the cast for making in good shape? You can go with orthodontic treatment to get your teeth aligned. This is done using braces. There are two types- metal and ceramic braces. If you r concerned about aesthetics you can opt for the second one that is ceramic or invisible braces. Sir I have removed my teeth what to do after it pls suggest me urgently how to eat ho to brush. Do's - first, bite firmly on the gauze for atleast 45 mins. Take soft, cold food, take the medicines prescribed by your doctor, maintain oral hygiene. Do not's - avoid constant spitting, do not meddle the extraction site, do not take hot food/drinks. I don't know why my mouth stinks I daily brush then also smell is coming out what should I do? Bad breath can happen due to many reasons. Dry mouth is also one of it. If your saliva production is less halitosis occurs but this can be treated. Deposition of plague in your tongue also causes bad breath. You should visit a dentist to know the sole reason. I m having pain in my gum because of wisdom tooth, and my gum is reddish what should I do? Pain in gums of wisdom teeth is called pericoronitis. Due to lack of space in your jaw, your wisdom tooth may be partially out due to which a flap of your gum must be covering it. This flap causes inflammation. Please consult for a detailed treatment plan. I have pain in teeth. Dr. Say to do root canal. If I remove that teeth? Is there any problem for meI'm 19. You are just 19 years old. I would suggest you to save your teeth and infact get a root canal treatment done for the same. Removal of teeth is not the only option. My front upper teeth are not in symmetry. Which treatment will be best for me braces or cosmetic dentistry? Braces is the right option for you. You are 19 years old, and now orthodontic treatment will give you best results. You can also go with ceramic or invisible braces if aesthetics is a concern.